Here are some facts about Tudor theatre. You might know some of the information already, but hopefully you’ll learn something new as well. The Tudors certainly didn’t invent acting – The Ancient Greeks and the Romans built theatres many years before the Tudors did – but they loved to watch plays and they helped to shape today’s plays and theatres. In the summer months, groups of actors from London would take a show on the road. They would load up wagons and carts with all of their costumes, scenery, props and a stage, and perform plays in town squares and inn-yards. The audience was sometimes charged a fee to watch the play, or a hat was passed around to collect money (a bit like buskers do today). Inns really liked having their inn-yard turned into a temporary theatre because they could sell food and drink to the audience. Some inns became full-time theatres with plays being performed on a regular basis. In Tudor times all of the actors were male. Female roles were played by boy’s whose voices had yet to break. In 1572, a law was passed in Parliament making it compulsory for all actors to have an acting licence and a lord as their supporter. As a result of this law, several acting groups (or companies) were set up. James Burbage started a a company called The Chamberlain’s Men (supported by the Lord Chamberlain). Other groups included: the Lord Admiral’s Men, the Queen’s Men (supported by Elizabeth I herself), Lord Strange’s Men Acting Troupe and the Earl of Leicester’s Men. The rich boys who attended schools like St Paul’s and Chapel Royal set up their own acting group called the Paul’s Children. They performed about once a week on a stage near the old St Paul’s Cathedral, and regularly acted for Elizabeth I. In 1576, James Burbage (an actor who was formerly a carpenter) built one of the first theatres in London. It was constructed north of London, beyond the city walls, and was called the Theatre. Philip Henslowe, a businessman who had made money by putting on plays and running bear-baiting contests, built the Rose theatre in 1587 in Southwark, south of the River Thames. The Globe theatre was built in Southwark by James Burbage’s sons – they did this by taking down the Theatre and re-using the materials. Other famous Elizabethan theatres were the Swan and the Fortune. Elizabethan theatres were quite a bit different to today’s modern theatres. They were mostly open air and looked like an O from above. The stage came out into the centre of the O and the audience stood all around it in an area called the yard or the pit. The rich could sit in covered galleries around the edges of the yard. A building was built to the back of the stage. This was brightly painted and used by the actors in scenes of the play they were performing. 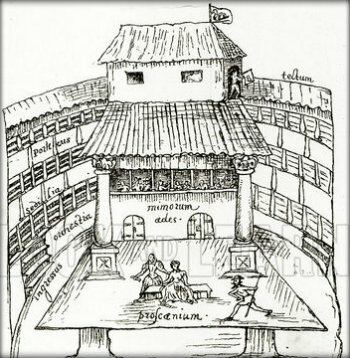 A drawing of the Swan, showing the inside of an Elizabethan theatre. When the flag on top a theatre was flying, it meant that there was going to be a performance on that day. A trumpet blast let people know that the show was about to start. Both rich and poor people went to the theatres. The rich could afford to buy seats in the gallery, whereas the poor had to make do with standing by the stage. William Shakespeare was the most famous of the Elizabethan playwrights. He was born in Stratford and moved to London, joining James Burbage’s acting company. He went on to write over 30 plays, including Romeo and Juliet, Hamlet and Macbeth. To find out more about William Shakespeare, click here. Christopher Marlowe was another popular Tudor playwright. Why did sailors go on voyages of exploration during the Tudor period?